15 April 2019 (FAO)* — 25-year-old Alvina Doris Ntsame Akono lives in Oyem, situated in the Woleu-Ntem province of northern Gabon. After dropping out of high school for financial reasons, she learned about the breeding profession from a friend who was already in the field. Within a few months, she uncovered a passion for breeding domestic animals. She soon became entrusted with a farm of 15 pigs, which allowed her to turn her passion into a reality and into a full-time job. Like Alvina, the inhabitants of Oyem are mostly small-scale farmers and breeders. 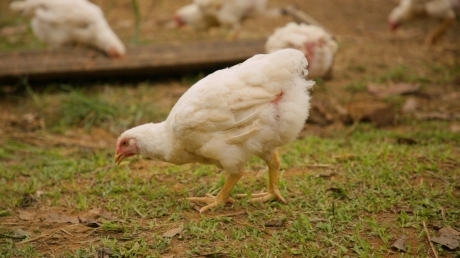 The soil is fertile, and the demand for poultry and pork meat is steadily increasing. However, most farmers have little access to seeds or animal feed. In addition to this, there is a lack of tools and knowledge about good practices for food production and modern livestock management. The high cost of feed also poses major obstacles to livestock development and income stability for smallholder breeders. Alvina, together with 250 other farmers, was selected to participate in a training on cooperative management and feed production. The latter, requested by the Government of Gabon, consisted of evaluating the potential of raw material available for the production of animal feed and has helped boost the livestock sector’s activity and increased production of quality meat products at competitive market prices. 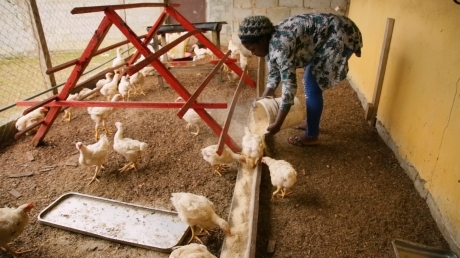 “Today, with efficient and affordable animal feed manufacturing, which has helped to reduce production costs, I produce an average of 500 chickens every 8 weeks. I sold all of my first production on the local market because in Oyem, chicken is a very popular meat during family ceremonies and in the two months that followed, I raised even more chickens. It was unbelievable!” says Alvina enthusiastically.The members of Alvina’s cooperative are active and have diversified their activities by producing vegetables and fruits to sell at the market. They use the organic material resulting from the breeding to fertilize these plants. “Gradually, my business is growing and my products are more and more in demand. My ambition is to increase my production to 5 000 chickens within two years and to employ fellow young Gabonese!” says Alvina with a smile. “Business has always been important to me, but I did not have the capital or the skills. And, beyond that, I lacked the confidence to get started. During the training, we were encouraged to become entrepreneurs and given the means to do so,” explains Alvina. Improving people’s livelihoods through capacity building is essential for reducing poverty and hunger, especially in rural areas. In Gabon, FAO supports agricultural social protection programmes that enable rural farmers to build their capacity to manage risks, carry out more productive activities and create a future with #ZeroHunger.